The Acuity EY features a CMYK + W color channel configuration for an affordable solution for a number of display graphic and sign print applications. The versatility of printing high quality, 1200 dpi or greater graphics on rigid, flexible and even roll media gives franchisees a new opportunity to expand their print capabilities…and ultimately their business. In addition to the dedicated flated, the Acuity EY offers a Roll Media Option. Zoned Vacuum Flatbed – Three dedicated vacuum zones tailored to common media sizes reduce the need for bed masking. Adjustable vacuum strength allows for optimum handling of different materials. Roll Media Option – A compact roll-to-roll unit extends the versatility of Acuity EY. High quality images can be printed on roll media which look great even at close viewing distances. The Uvijet family of inks offers excellent adhesion and application flexibility. 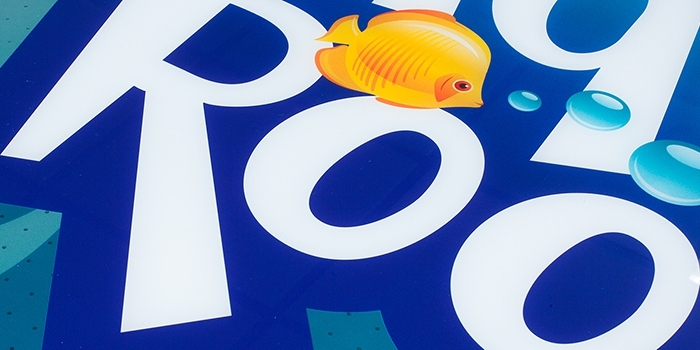 Ideal for both indoor and outdoor applications including banners, POP, backlit images, exhibition graphics, signage, printing onto glass, metal, acrylic and board. The Acuity Select EY series uses Uvijet KI and Uvijet KV UV curable inks.